Nintendo has issued a statement following a predictable spate of complaints from gamers suffering headaches and eyestrain when playing the new 3DS console. Despite a successful launch of the new glasses-less 3D handheld console this weekend, a select few buyers have made waves with their inability to play comfortably. Defiantly, Nintendo's UK PR head Rob Saunders says that the feedback has been overwhelmingly positive since Friday's launch and a risk of discomfort comes with the territory of 3D content. 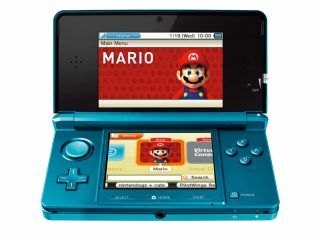 "We have shown Nintendo 3DS at multiple events around the world to literally hundreds of thousands of people and have received very few negative comments," he told Maxconsole. "As with anything that requires focus, from reading to staring at a computer screen, taking breaks frequent breaks is always recommended. "When viewing any kind of 3D images, some people might experience minor discomfort. The effects are short term and have no lasting effect, in fact most players can continue after taking a short break. "The Nintendo 3D was designed with a 3D depth slider that lets users adjust the 3D effect to a level that suits them for optimum enjoyment." Basically Saunders is offering a priceless piece of advice to all those Nintendo fans experiencing discomfort: If you don't want a headache, don't stare at a tiny screen for hours on end. You're welcome.